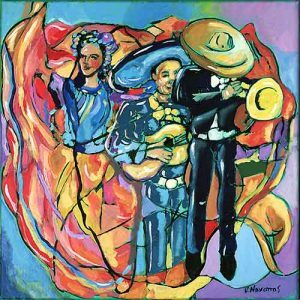 Victor Navarro provides artwork for the Tucson International Mariach Conference. 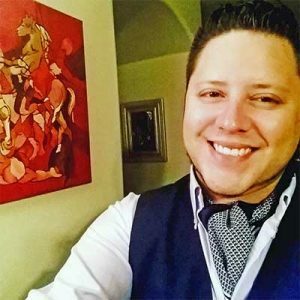 Victor Navarro was born in 1988 in Guadalajara Mexico, He received his B.F.A from the University of Arizona in 2010. Exhibited in international art platforms in France, Germany, Japan, Russia and Mexico. Victor engages in particular with mixed media evoking the essence of embracing color and line to create exhuberant images. 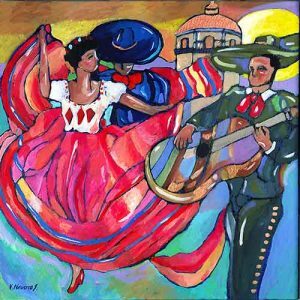 His Fine Art Collection ” Colores de Mi Tierra” evokes the colorful spirit of Mexico, its folklorico, music and festive essence. Bringing into our lives the smiles and emotions that our heritage evokes.